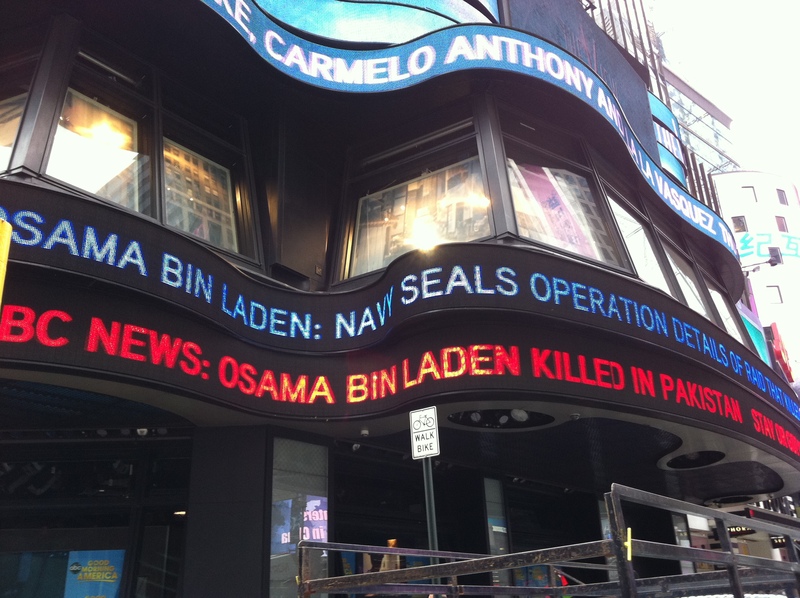 So, before the breaking story last night with the incredible news that Osama Bin Laden had been killed, a little tweet on twitter caught my eye. Rob Lowe would be signing copies of his new book “Stories I Only Tell My Friends” at the Barnes & Noble near Rockefeller Center on Monday. Huh. I am currently reading Rob Lowe’s book (on my Nook) and am really enjoying it. It is well written and quite captivating. 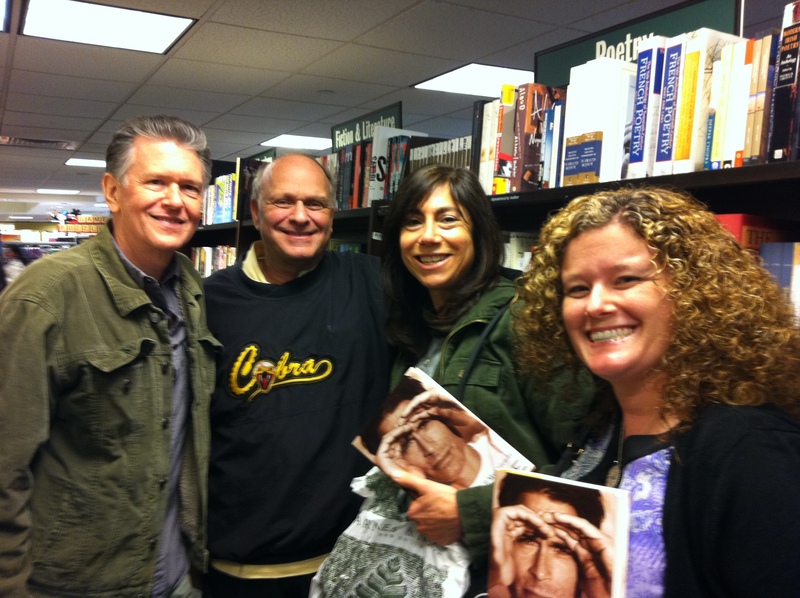 I decided that I would venture into midtown to buy a copy of his book and get it signed by him. 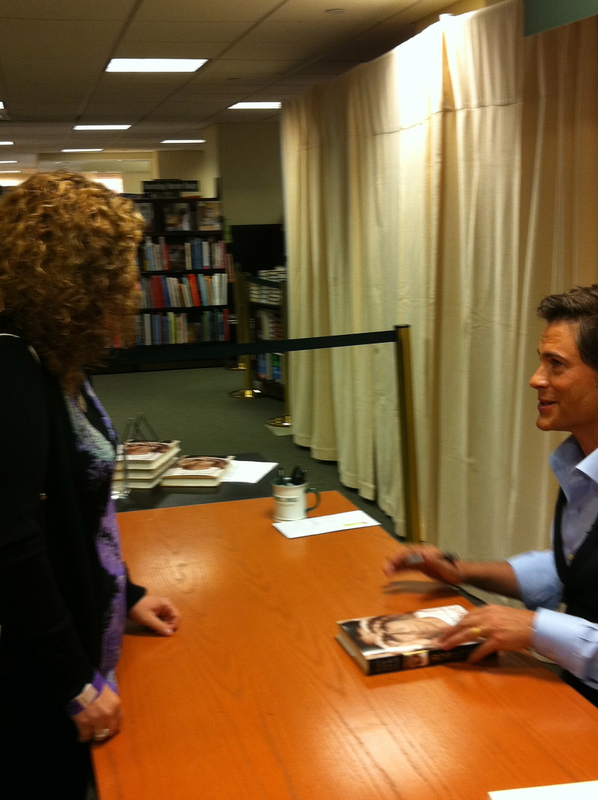 As my wise husband said “Are you really too busy to go and meet Rob Lowe??”. Um, NO! And so, this morning I embarked on my latest adventure in this great city. I popped out of the subway in Times Square. I have to admit I was a bit tentative to see what the mood would be like there. Would there be protesters, people still celebrating or would there be a larger police presence? To the contrary it was actually a very quiet morning in Times Square, lots of tourists as per usual and the hustle and bustle of people going to work. The only noticeable difference was that people were stopping to read the news headlines that were flashing across numerous screens. 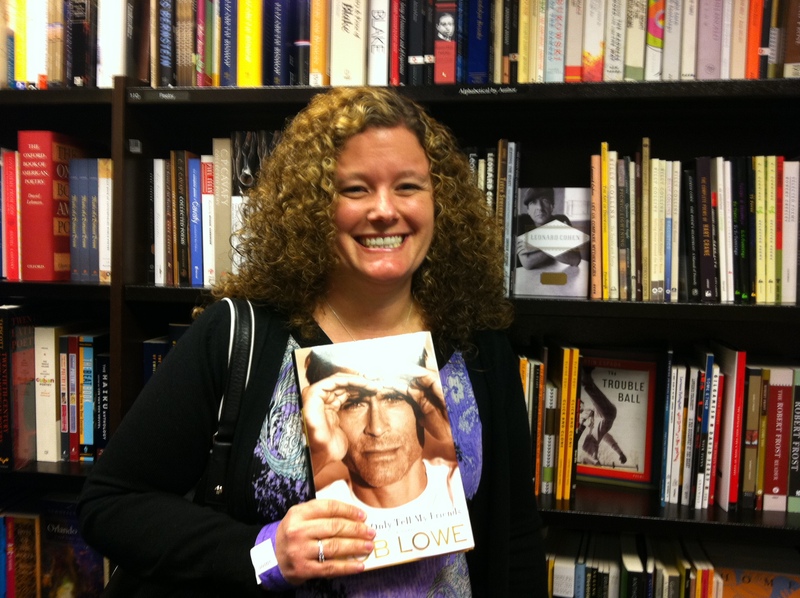 I continued on my way to the B & N. I arrived at 11:00 and Rob Lowe was not scheduled to arrive until 12:30. There was already a line that wrapped around the block. Not too bad. I debated if I actually wanted to stand around and wait. And then I gave my head a shake! First, this was Rob Lowe I was talking about and second, I live in NYC and am currently not working if I don’t take advantage of these situations now, when will I??!! I went in, bought the book, received a wrist band and made my way to the back of the line. Luckily I ended up standing on line with some interesting and fun people who made the time go by faster. We chatted about movies, Osama, celebrities and also the strange mix of people that were waiting to see Rob Lowe. Because it was a very weird mix. There was a guy who had flown in from Florida- can you say stalker??!! I figured it would be largely women my age or older who had always had a wee bit of a crush. Not so, there were lots of men, younger girls and much older women. I guess he appeals to all audiences. It was definitely a fun people watching moment. RL: (looking up and making eye contact) Hi there! Me: (Trying not to stare too boldly into his amazing eyes) Hi, how are you? RL: Great, thanks for coming. Me: I am really enjoying your book and I am also watching re-runs of The West Wing, one of my favorite shows of all time. RL: I am soo glad you are liking the book. If you are reading the book and watching The West Wing (laughs) then you really don’t need to know anything else about me. Thanks for coming out today, have a great day. Me: (Trying not to swoon) Thank you, my pleasure. One last pic cause he's so damn cute! And now, I am back home doing laundry and rushing around to finish up errands before the kids get home! Back to reality. But I have to admit I am doing it all with a bit of a twinkle in my eye and a bounce in my step. Have a great day everyone!! I think I would have brought up his role in Wayne’s World. You lucky girl !!! I love Rob Lowe !!! !